There are times when the perspectives of bitter, vile and shallow people are displayed in such a manner that it becomes difficult to find words to describe them. This video excerpt from a CNN panel discussing Kanye West is one of those indescribable examples. Think about this CNN panel segment from the perspective gleefully denigrating and attempting to humiliate another person, any person, simply because you disagree with their views on any issue. Laughing as they each try to one-up each other in the level of belittlement. 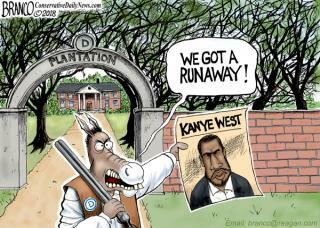 This entry was posted in Politics, Racism and tagged CNN, Kanye West on October 10, 2018 by Bone Fish. It’s obviously an attempt to reduce the attrition of black democrats converting to the republican party.